In honor of our 1957 founding we have 1,957 minutes to make an impact on UNLV! Be a part of #RebelsGive! Today's the day! #RebelsGive is official at 10 a.m. join with the entire UNLV community for the next 1,957 minutes, in honor of the 1957 founding of UNLV, to make an impact of the lives of over 30,000 UNLV students and the entire Las Vegas community. After you make your gift, sign up on the "Ambassadors" tab and become a Rebel Ambassador, be sure to join us for all our #RebelsGive events throughout the next 1,957 minutes! Update your Facebook frame! Select your profile photo and then select "frames", search "UNLV" and pick one of your favorites for #RebelsGive. #RebelsGive Kickoff Celebration, Oct. 11, 9:30 a.m. - 10 a.m. Join us for the official countdown and kickoff to Rebels Give. Doughnuts, coffee and juice will be provided as we celebrate, in true Rebel style, UNLV’s first day of giving. The marching band, pom squad and even confetti cannons will make this a celebration you don’t want to miss! #RebelsGive Mixers, Oct. 11, 5:30 p.m. - 7:30 p.m. Join us for #RebelsGive mixers across the Las Vegas Valley (Lazy Dog - Town Square, Aces and Ales - Summerlin and Pizza Rock at Green Valley Ranch - Henderson) to celebrate the conclusion of day one and drive social media participation. Appetizers are on us! #RebelsGive Late Night Breakfast: Neon Edition, Oct. 11, 11 p.m. - 1 a.m. Join us as we celebrate the close of night one of Rebels Give. We’ll have a DJ, neon swag and make your own GIF photo booths! Come get your pancake fix for free and a $5 suggested donation to your favorite area of UNLV! Rebel events card required for student entrance. The Drive for 1,957 - Let's do this!! Thank you, thank you, thank you ...THANK YOU!!! Because of you, we have raised approximately $525,000 from nearly 1,650 gifts as of 3:45pm PT during our inaugural #RebelsGive. This enormous demonstration of Rebel generosity has inspired us to push for a goal we never imagined would be possible - raising 1,957 gifts to match our 1957 founding. Log on and make another gift. There are still dozens of matches and challenges that will allow you to double the impact of your gift! Share, share, and share some more on social media. Every time you post the RebelsGive.UNLV.edu link to Facebook, Twitter, or LinkedIn or share via email or text message, we get closer to our goal. 1,957 for 1957 - help us make it happen and finish #RebelsGive strong! Hey Rebels! It's been an amazing day 1 of the inaugural #RebelsGive. As the evening approaches, you've given close to $300,000 from nearly 900 gifts. You. Are. Amazing. THANK YOU!!! Are you interested in making another gift? 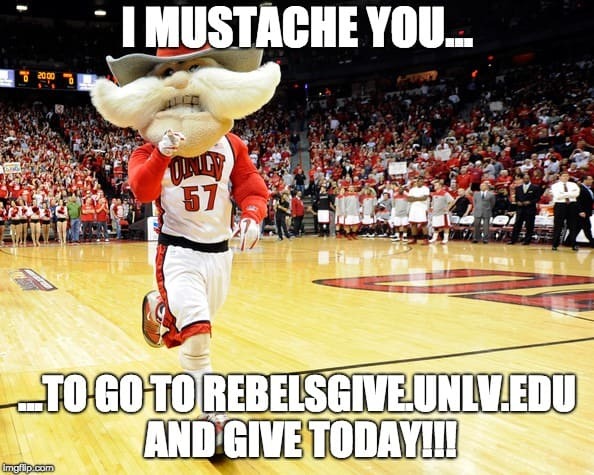 Go to Rebelsgive.unlv.edu and give now to double your impact! Or, share the links on Facebook, Twitter, LinkedIn, on email, or via text message. When you paste the RebelsGive.UNLV.edu link, a custom graphic appears in your social media platform of choice. Sharing across social media is proven to drive fundraising support. So sharing truly is more than caring! Then check out this special "thank you" message from two of our top #Rebelambassadors - Sam Lieberman, '96, Board of Regents, Nevada System of Higher Education and Stacy Swim, '98, Fine Arts Chapter President. Rebels Give - Across the Country!